Hawker centers are a defining part of Singapore life. First built in the 1970s, they were created by the government as part of a public health program to relocate street and itinerant hawkers to raise hygiene standards. Although the provision of affordable food to the masses was not the original objective, hawker centers have since become vital social spaces that offer a wide selection of affordable food for all. A significant policy shift in 2011 led to the revival of the government's Hawker Centre Building program after a 26-year hiatus and the removal of reserve rents. As a result, hawker stall rents have dropped, giving aspiring entrepreneurs—no matter their financial background—an equal stab at success, while keeping hawker food affordable. In the 1950s and 1960s, unemployment was rife in Singapore. Many people took up hawking as a means of livelihood. It was a lucrative trade as it required little capital and yet generated good income. However, the proliferation of street hawkers brought about a host of social and public health problems. Lack of direct potable water supply for the preparation of street food and the washing of utensils gave rise to food hygiene concerns. Food waste was also indiscriminately disposed of onto streets and into watercourses. Parts of the city resembled slums with old makeshift sheds and structures put up by hawkers. In 1950, the British colonial government set up The Hawkers Inquiry Commission, which reported that: "There is undeniably a disposition among officials...to regard the hawkers as primarily a public nuisance to be removed from the streets." A new set of policies and measures was needed to tackle these issues. When Singapore gained independence in 1965, one of the very first things the fledgling government did was to decide on a long-term approach to solving the street hawking problem once and for all. In 1971, the Singapore government embarked on a program to build hawker centers with proper amenities. Street hawkers were relocated progressively into these newly established premises. A total of 135 hawker centers were constructed from 1971 to 1985, and all 18,000 street hawkers were resettled by February 1986. Over the years, these hawker centers became a fundamental part of Singapore life. In a 2005 government survey, 37% of respondents said they were “very frequent” customers of hawker centers, eating there as often as eight times or more per month, or an average of at least twice a week. The Ministry of the Environment and Water Resources is committed to providing a range of eating options, including Halal-certified food stalls to serve Singapore’s multi-ethnic communities. Hawker centers are thus places where people of different races, religions, and cultures mingle. Furthermore, the affordable and delectable food sold in hawker centers attracts both the rich and poor to queue together for their favorite fare. Hawker centers also constitute a significant source of employment for Singaporeans and Permanent Residents. When some of the relocated first-generation street hawkers left the trade because of old age or death, vacant stalls became available in hawker centers. In response to public requests for stalls, the government introduced a tender scheme in 1993. Under this scheme, vacant stalls were tendered out on a three-year basis with reserve rents, or minimum rents, set at 85% of prevailing market rents for all cooked food stalls, and 80% of prevailing market rents for market produce and lock-up stalls. While there was no cap on the tender bids, tendered rents in the hawker centers by and large remained affordable, as compared to the higher prices paid by those who operated in privately run food establishments like coffee shops and food courts. To a large extent, there was an unexpected and unintended evolution in the role of hawker centers over time. From serving the original objective of raising public hygiene standards, hawker centers began to perform a social purpose. Not only could people with few or no educational qualifications find employment in hawker stalls, but those who worked hard to earn a good livelihood also had the chance of elevating their social status. An example of such success is the hawker behind Ya Kun Kaya Toast, which started as a humble stall selling toast with coconut egg jam in the Telok Ayer Food Centre in the 1960s. Today, it is a well-known chain of franchises. 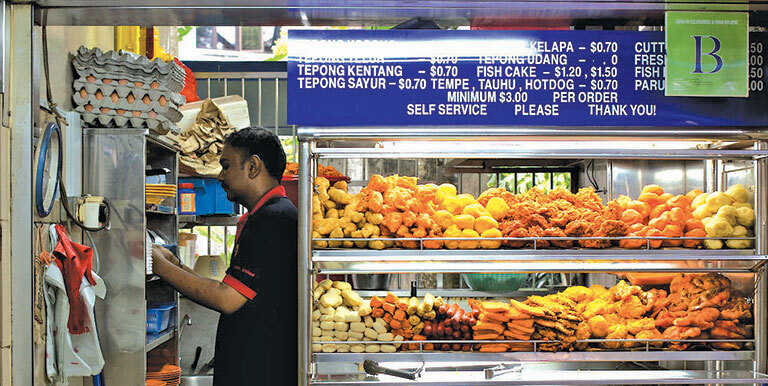 The government stopped building new hawker centers in 1985 after successfully resettling street food vendors, with the construction of similar structures entrusted to the private sector. This policy changed in 2011 when then Minister for the Environment and Water Resources, Dr. Vivian Balakrishnan, announced that the government would restart the Hawker Center Building program "to put downward pressure on rentals." This significant policy shift was largely motivated by the rising costs of living faced by many Singaporeans, especially those residing in housing estates built after 1985 that do not have hawker centers. The program involves the construction of ten new hawker centers by 2017 in areas that are relatively under-served. While the government could not step in to control the prices of food sold by hawkers, they could intervene by increasing the supply of hawker stalls. This would allow more hawkers to ply their trade because of cheaper rents, with consumers likely to benefit from these lower costs. The government made further enhancements to push down rental costs by making changes to the tender scheme in March 2012, removing the reserve rent requirement for tenderers. The removal of such requirement meant that vacant stalls can now be allocated to the highest bids, whatever the bid prices may be, as long as there are competitive bids. The policy changes bore fruit immediately. After the reserve rent requirement was removed in March 2012, 55% of the stalls awarded in the tender exercises from then till December 2012 were allocated below the reserve rents. At the lower end of the range, a cooked food stall at Taman Jurong was awarded at S$21 (US$17) per month and a market stall at Changi Village for S$5 per month (US$4). According to a 2009 Lifestyle Survey by Singapore’s Urban Redevelopment Authority released in 2010, food and beverage outlets, including hawker centers, constitute an essential factor in the quality of life in Singapore. The positive public feedback on the building of new hawker centers, as well as current bidders' reactions to the changes in the tender scheme, reaffirm the importance of and demand for hawker centers. Furthermore, hawker centers are central to the identity of a neighborhood and are features that make Singapore unique. As of April 2016, the National Environment Agency managed 109 hawker centers in Singapore, housing over 14,000 licensed hawkers, including about 6,000 selling cooked food. Moving forward, the agency recognizes that hawker centers should continue to be run on a not-for-profit basis and will ensure that they provide convenient, accessible and affordable food to the general public. The year 2012 marked the construction of a new generation of hawker centers, which will be attractive, practical, cost-effective and environmentally sustainable, and encourage social bonding. These 20 new centers will be progressively completed by 2027.